After having passed by Cafe Aion, the barely-new-anymore restaurant on the hill, for a year or two now, I finally decided to give it a try. The restaurant, not cafe, is tucked away behind the Innisfree bookstore and poetry cafe on the corner of 13th and Pennsylvania. The building has a pleasant-looking quaint brick exterior with a painted vintagey “Aion Books” sign left over from the bookstore that was originally there. After finding your way through the inconspicuous entrance, the restaurant opens up into an actually quite chic and understated oasis, nicely balanced in its relaxed coziness by a professional we-know-what-the-f#&k-we’re-doing-here vibe and waitstaff. For my first visit, I sat on the patio running along the front of the restaurant. I can imagine that while school is in session, the patio would provide only a noisy view of honking cars and girls in miniscule skirts stumbling in packs carrying their heels. Which I guess has a certain masochistic voyeuristic appeal depending of what you’re going for. But in early August, the patio was a quaint and candle-lit sanctuary in which to slowly transition from well-lit appetizers to a second-glass-of-wine sunset, to desserts under a faintly-lit night sky. The restaurant aspires to represent the small-plate family-style format and cuisine of Spain and Northern Morocco. Almost all of the ingredients in Aion’s kitchen comes from (very) local farms whose names any foodie in Boulder would readily recognize. In a very Portlandia-esque moment, our waiter listed off the names of the farms who raised the chicken, pork and beef served at Aion and the fish-monger friend up in Alaska who no doubt catches the salmon he peddles with his bare hands. Their charcuterie is cured in-house and pastries baked in the back. In a way, I find this rampant farm-to-table trend obnoxious, probably because like any “trend”, it’s following is acquired through image-seeking, not genuine interest or participation. Then again, whatever it takes to bring people closer to the ground beneath their feet, even if it’s paradoxically inspired by the image of such, I have to begrudgingly support. Regardless, it all manifests in cafe Aion to create a restaurant whose flavors aren’t just the same amalgam of local purveyors as the next foodie hotspot, but are instead distinctly created in the same room as where they’re enjoyed. And that’s my kind of meal. Needless to say, the food itself was delicious. The tapa format runs the risk of being pretentious and more concerned with blowing your foodie mind than with creating a pleasurable eating experience. Aion however balances its creatively assembled small-plates with a simplicity that draws attention to the courses without losing focus on the meal as a whole. 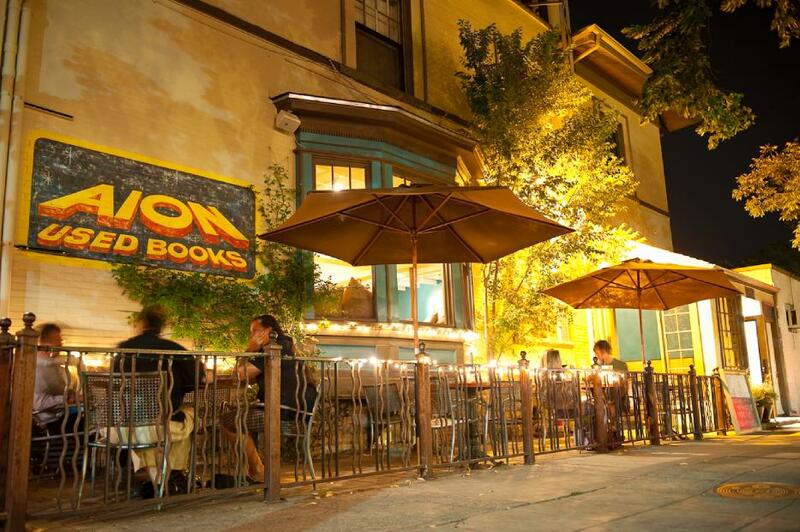 Any foodie’s map of Boulder would be incomplete without the mention of Cafe Aion. And likewise, any Aion meal would be incomplete without the finishing touch of their dark-chocolate-dipped churros, a reason unto itself to fight for parking on the hill. Or, in the true Moroccan fashion, to dig your donkey-pulled rickshaw out of back of your garage. Did you visit the farm where Colin was raised? Great piece, I think I’ll try the churro and a big red wine.